URBANA, Ill. – Given the persistence of cold and wet conditions into early April, it is clear spring of 2018 won’t allow an early start for field operations across Illinois. Emerson Nafziger, recently retired professor in the Department of Crop Sciences at the University of Illinois, explains how soybean growers can cope. Farmers’ most pressing concern is when to start planting. After some success with very early (February) soybean planting in 2017, Nafziger says a few took advantage of a short window in mid-March this year to plant. The weather since then has not been kind, and it looks like the success in 2017 may not repeat this year. “Soybean seedlings are somewhat tolerant of below-freezing temperature after they have emerged, but seed in cold, wet soil may not live long enough to emerge,” he says. While soybeans can sometimes be planted before April and survive, Nafziger says there is virtually no yield benefit for early-planted soybeans versus ones that are planted in late April or early May. Nafziger’s trials across 26 sites show that soybeans should produce maximum yield if planted anytime between the second week and the last week of April. The rate of yield loss accelerates when planting is delayed after May 1. The response curve predicts that the crop will lose about 6 percent of its potential yield by May 10, about 10 percent by May 20, and about 15 percent (10 bushels in these trials) by the end of May. Planting early helps the plants get off to a quicker start, which increases the chance that the crop will be able to respond to favorable conditions later. Still, early planting needs to be kept in perspective: planting into wet, cool soil conditions can cancel the benefit of early planting. “While we can’t do much to change the weather, we can control seeding rate, and higher seed costs have had some thinking about lowering seed rates,” Nafziger says. “Our research shows that trying to minimize the seeding rate can end up costing yield and profit, especially in those cases when emergence and stand establishment are lowered by conditions at or after planting. Nitrogen has gotten attention in recent years, because some promote it as the key to making high soybean yields even higher. Nafziger’s trials, and most other trials across the Corn Belt, have shown little or no yield increase from applications of 45 to 90 pounds of nitrogen (100 to 200 pounds of urea) during the growing season, but the practice continues to draw a lot of interest. 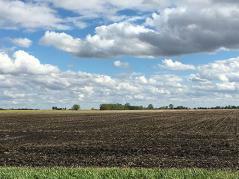 “While we seldom see responses to nitrogen on prairie soils, we were surprised to find, in two of three years on an irrigated loam soil north of Peoria, large increases from applying nitrogen at planting time,” he says. He adds that applying nitrogen four times per season produced yield increases more often than when applying only once, but the yield increases didn’t come close to justifying the cost of these applications. Putting that much nitrogen on also means excess nitrogen in the soil at the end of the season, so more nitrogen loss through tile drainage. This season, Illinois soybean acreage is expected to stay at its 2017 level in Illinois, while corn acreage again decreases slightly. This will mean that some soybeans in 2018 will follow soybeans planted last year. Nafziger says there is no particular concern in planting soybeans after soybeans, except to avoid it if soybean cyst nematode egg counts are high. Cyst nematode egg counts often increase when soybeans are in a field, so SCN-resistant varieties are a must for soybean following soybean. “The yield penalty for soybeans that follow soybeans instead of corn varies some by site and year, but in our research this penalty has been only about 5 percent on average, ranging from 2 to about 10 percent. In 2017, soybean following two years of soybean yielded about 2.5 bushels less than those following one year of soybean,” he says. Cereal rye planted into corn stalks last fall has produced much less growth than normal due to the cool temperatures this spring. Rye will start to grow rapidly once it warms up, but wanting more cover crop growth and needing to get soybeans planted might represent a conflict for some producers, Nafziger says. For more information, see Nafziger’s full article on the Bulletin.